Greetings once again from a somewhat frazzled Philadelphia countertenor! I am in the midst of preparing for both my Master of Music Degree recital and an upcoming research and performance trip to England, all the while keeping up with coursework, working a part-time office job, and teaching private students as part of my graduate assistantship. I am not fishing for pity, nor do I wish to complain; there are certainly less desirable things by which one might be kept so busy! Each of the aforementioned responsibilities is certainly a worthwhile topic of discussion, and they may very well make appearances of their own in future blog posts; however, I wish to stay on task and address the issue I signed off with last month: Recordings. I just submitted an audition CD for the London Handel Society’s 2011 Singing Competition, so this topic is still quite fresh for me. It is here that I must make a confession. I may or may not have a bit of an issue with procrastination. Alright, I DO have an issue with procrastination. We all have shortcomings and for the sake of openness I will say that I am still dealing with this one. As suspicious as this may sound following my opening paragraph, I assure you that the P word has very little to do with my current, unnerved state! At this point, you may be thinking, He seems to be gearing up for a talk about time management rather than audition recordings. You may even be scoffing a bit, thinking, He’s in denial about that last bit. To each of these thoughts, my response is: Perhaps. Perhaps in my current predicament it serves us both to meditate on a subject that my procrastination recently made a bigger issue than it had to be. If there is one thing I would urge other emerging artists not to put off, it is building and maintaining a current and varied library of audition recordings. In this age of at-your-fingertips technology, more and more graduate schools, conductors, competition panels, and management companies are doing away with live auditions in favor of CDs, mp3s, and Youtube videos. 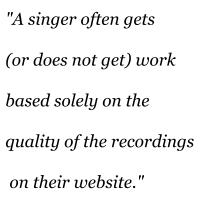 A singer often gets (or does not get) work based solely on the quality of the recordings on their website. While this may not be news to some, what is worth noting is that you cannot rely on a grainy recording – thrown together at the eleventh hour – to get you by. It was due to a series of unfortunate events – most of which were admittedly my fault – that I found myself scrambling to choose audition recordings for the London Handel Competition. The deadline was fast approaching. In a single two-hour session, I recorded the two arias I hoped to submit. After sharing these recordings with a colleague and fellow countertenor, I had my worst fears confirmed: one of the tracks was unusable. I was able to select two good recordings for the application; fortunately I had a couple of older recordings to draw from. I should not have placed myself in that situation, nor am I particularly proud to share it. And yet it is what it is, and we can learn from it. What made this application so difficult was the scope of the repertory. The competition has three rounds, the first by recording or live audition. Each round must consist of unique repertoire entirely from Handel’s oeuvre, so anything I included on the initial recording couldn’t be used in later rounds. Such restrictions are not uncommon in higher profile competitions. There comes a point at which undergraduate recital recordings and grad school audition recordings become not only outdated, but also insufficient to such repertory requirements. 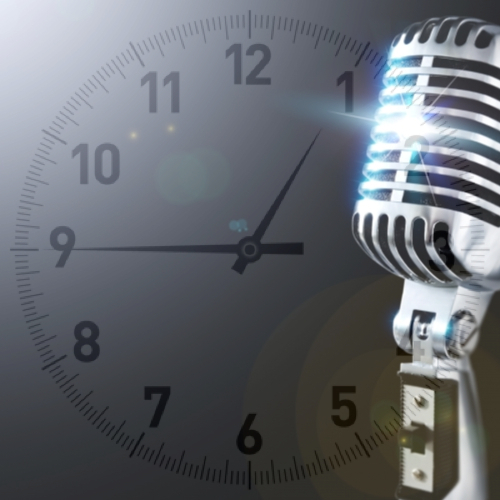 There are other important considerations when submitting an audition recording, such as sound quality, and the quality of the musicians you record with. Since affordable portable digital recording devices are widely available, an amateur-sounding recording is no longer an option. The Fall 2010 Early Music America Magazine features a great article called Gear For Your Gig that covers options at several price levels. 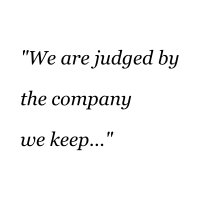 Likewise, we are judged by the company we keep, and our own taste may come into question should we submit a recording with a sub-par accompanist. Furthermore, in situations where a recording is optional (due to distance), we must bear in mind that our competition may have the benefit of a live audition. It is a strange trick of the ear, but we are much more forgiving of vocal imperfections when the singer is standing in front of us. Although I have yet to hear the results of the preliminary round, I have already made plans to record a great deal of my current repertory with a trusted colleague. I cannot stress enough the importance of recording when you are NOT under a deadline, as we perform best when we enjoy ourselves. The pressure of a tight deadline rarely produces an enjoyable performance! Record often, set reasonable session goals, and don’t rely solely on your own judgment to select the best tracks; the honest opinion of a respected colleague can be a godsend. They hear not only the mistakes that you think no one will notice, but also the good parts that your self-critical ear ignores. In fact, you would do well to have a trusted set of ears help you produce the actual session. That will take the pressure off you to listen critically while you are singing. Additionally, make an effort to get copies of your live concert recordings. Unless an orchestra’s union contract forbids it, most conductors are happy to let you forward your career with their recordings. The best time to get them is from the engineer immediately after the concert, so bring your laptop (in case they have a CD) and a multi-card USB memory reader (in case they record to flash media – which is increasingly common). If someone has to mail you an actual CD that they had to copy, the chance of ever getting it drops significantly! I hope you will join me next month as I write to you from England about my Handel Pilgrimage and project centered on his opera Orlando. Bryan DeSilva is an up-and-coming operatic countertenor whose voice has been hailed as "otherworldly," possessing "a warm and honeyed tone." He holds a Master's Degree in Vocal Performance from Temple University's Boyer College of Music and currently lives in Philadelphia. Follow him on Twitter or Facebook.